We have officially started a Apologia's Astronomy book as our Summer Science. This is not part of our official curriculum but more of a test drive to see if we like "textbook science" The hope of using it is that it will keep us focused and help us learn new things. I figure summer is the perfect time since we camp quite a bit and can see the night sky much better. Also with the recent one in a life time opportunities, (the space shuttle stuff recently and the upcoming VenusTransit) I felt compelled to focus on Astonomy. Our first lesson was an overview of the solar system. I tried reading Froggy the textbook passages but neither one of us could stomach them. So we skipped that. I will read the textbook and share any sections that contain new information. Froggy made a notebook to document her learning through this process. I was surprised at how much she enjoyed the project. Her first "assignment" was a pneumonic to remember the order of the planets. Then we made a scale model of the solar system and hung it up in our school room. The "sun" is not in scale because it would be impossible to hang if it was but everything else is. It is hard to see in the picture but we used colors indicative of the planets when possible. 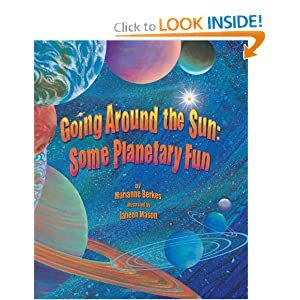 Since I refused to read the text of the book to Froggy, I found some other books about the solar system that I was willing to read. We pulled out an old favorite, Going Around the Sun, which we have read time and time again but still enjoy immensely. We also read Boy Were We Wrong About the Solar System, which shows how scientific thought has changed over time. It was fun for Froggy to see that even scientists make mistakes and learn new things and what we are teaching and learning is the best information we have but may very well not be right. We also got a book, Stars, Stars, Stars which is more about Astronomy in general than the solar system in specific. It is written in a very juvenile manner but the information in it is good if you can get past the silly style. I really like the balloon planet project. I think I could adapt that for my 3 yo with colors and counting for our Outer Space theme. Thanks! This is the second post this week about astronomy. I love it when I get several posts on the same topic in a week! This is one of my favorite salads to take to potlucks. It is based on this recipe but they make it so hard to get to I tweaked it a bit and put it here for easier reference. For at least 10 years now I have been waiting for this day. Froggy had her first Girl Scout Meeting!!! Her leader is a wonderful lady who is amazing at managing so many little girls. The troop is not a Jewish troop nor is it a homeschool troop but there are two other homeschool girls besides Froggy in the troop. At the meeting they had circle time during which they are working on learning the Girl Scout Promise. I used to know a song that teaches the Promise but could not pull it back to share. Guess I will have to work on that before the next meeting. They also made a really cute Promise craft which is a door hanger to help them remember it. Once they have learned the Promise, they will have earned the center of their Daisy which has a place of prominence in the front center of their tunics. Just to be sure it is not all work they played a neat game of keep the balloon in the air. The first surprise win was our new favorite pasta sauce. Froggy really likes pasta with red sauce but didn't really eat the sauce much. When I offered her this new sauce, she chowed down on it and licked up the sauce. She now eats the same amount of noodles with at least half again as much sauce and has no idea she is getting any veggies. It is a double win for the Ima.